Katie and the Marshal: A Montana Women Novella by Nancy Pirri is a short tale of a young man who buries his feelings of mistrust deep inside. As the Marshal of a Montana town, the young man protects women from vile cowboys and their evil spirited ways when they make assumptions about Katie’s Palace and the ladies who work there. Katie, the owner of Katie’s palace, never liked the idea of minding what a man says and has no intention of listening to the handsome Marshal James Freeman nor his warnings. 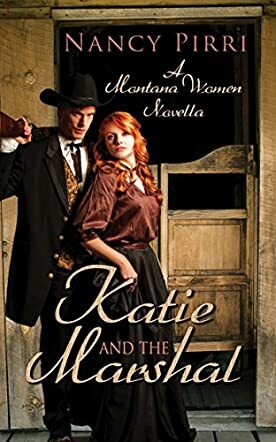 Katie and the Marshal by Nancy Pirri is an entrancing story that I would happily recommend to anyone that loves to read about romance in the West of yesteryear. In the story line of Katie and the Marshall, Nancy Pirri expertly commands the attention of the reader with lots of interesting twists that are fun and unexpected. I applaud how quickly the plot developed. I couldn’t stop reading until the story was over and was sorry to see the words ‘The End’ printed neatly at the bottom of the page. Much to my delight, at the end of this story, Nancy Pirri provides a peek into her next story, Annie And The Outlaw, which engages the reader deeper into Nancy Pirri’s world of Montana Women and their wonderful tales of romance in the face of the frontier they thrive in. I loved every detail about Katie and the Marshal and cannot wait to read the rest of Annie And The Outlaw. Nancy Pirri has an uncanny knack for writing bold romance novellas that will undoubtedly make themselves at home in any reader’s collection.